During the course of the Packers Field campaign, it was discovered that disused mine works existed under the site. This is common knowledge to local people, some of whom remember a shaft opening up in the early 90s and a user of the field falling into it. There is substantial evidence to suggest that uncapped mine shafts could still exist under the site, posing a potential health and safety risk to works contractors and future users of the site. This is supported by a report commissioned from Bristol Coalmining Archives (see below). The details of our research and the potential risks were sent to the Health and Safety Executive, Bristol City Council and the City Academy. The Health and Safety Executive reply stated that they are unable to deal with matters of this kind. The responses from Bristol City Council and the Academy, who do have responsibilities in this area, are felt to have been evasive and unconvincing. For example, Bristol City Council do not even have a record of the aforementioned mine shaft incident, despite it happening on 'their' land, and the filling of the shaft being organised by themselves. A number of other shortcomings are outlined below. Certainly, correspondence with the above parties suggests that the serious health and safety implications have been dismissed. Given this perceived lack of interest, we feel it is in the public interest that the full details of our report are made available. Below is the original letter written to the Health and Safety Executive, and also to the Academy and Bristol City Council. If you have any questions or concerns it is suggested that you contact these parties directly, or alternatively your local councillor or Member of Parliament (Look here for some contact detail). Complaint to the Health and Safety Executive regarding the planning application 03/02802/F/C (copy attached) approved by Bristol City Council (BCC) to allow the City Academy to develop Whitehall Playing Fields. The planned development of Whitehall Playing Fields by the City Academy, under lease from Bristol City Council, has thrown up a number of omissions and shortcomings which we feel should be known to the Health and Safety Executive. Due to a perceived lack of transparency and due process in past dealings with Bristol City Council and the City Academy, we are not confident that our concerns would be addressed impartially by them. We have however sent a copy of this letter to BCC. We have outlined our concerns below in as much detail as possible, with reference to Health and Safety Executive Planning Policy Guidance 14: Development on Unstable Land. - We know from our own commissioned report (copy attached) that a mine shaft opened on the site in the early 1990's. This is contradicted in the full planning application documents submitted to the Development Control Committee of BCC on 14/7/04 which states "there are no recorded shafts within the site". We feel this is a particularly striking omission seeing that Bristol City Council organised the capping of the shaft in question. This can be verified by John Cornwell from the Bristol Coal Mining Archive who was asked by Bristol City Council to be involved in the capping work. 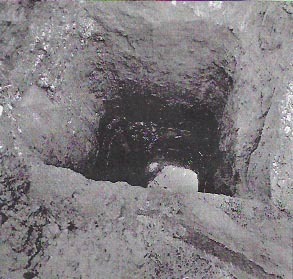 In fact a picture of the open shaft is included in Mr Cornwell's book about Bristol coal mines, "The Bristol Coalfield" (Figure 1). Furthermore, when we approached Bristol City Council about this event, they were unable to state any knowledge or records of this. This conflicts with Paragraph 2 of the PPG 14, which states that "where instability problems do arise, they should be adequately recorded so that the experience gained can be of benefit to the wider community", and also Paragraph 50, which states that "The importance of good accessible records of past events due to ground movement cannot be overemphasised and any future events due to instability should be adequately recorded for the wider benefit of the community"
Figure 1: Taken from "Bristol Coal Fields" By John Cornwell. "An unlined mid-18th century shaft found at whitehall in the 1990s. This shaft is sunk through Redcliffe Sandstone which will be about 40 ft thick to work a 5 ft thick coal seam." - The planning application documents also state that the only body used to advise on coal mining activity in the area was the Coal Authority. No other sources of expertise in this area appear to have been consulted, specifically the Bristol Coal Mining Archives Ltd (BCAL). We feel that the developer should have consulted this organisation in addition to The Coal Authority as a matter of course. Our reasons for saying this are contained within a report to The House Of Commons Trade & Industry Committee, relating to Former Mineshafts (HC495 - 17th July 1996, copy attached). This explicitly states that "the Coal Authority's records of former mineshafts are incomplete and sometimes unreliable". Paragraphs 36 and 37 go on to demonstrate the reasons for this and actually include a specific reference to Bristol, which had particular circumstances leading to incomplete records. Furthermore, Bristol City Council were actually involved in the compilation of the report to the House Of Commons and stated "BCAL's records are in some respects more comprehensive than those held by The Coal Authority". Given the magnitude of this statement we find it incredible that Bristol City Council / the developer have not consulted BCAL with regards to potential mineworks on the site, especially given Bristol City Council's past discovery of them. The House of Commons report also highlights the use of BCAL's data by property professionals in Bristol, due to a lack of confidence in the Coal Authority's data. From our own commissioned report (copy attached) carried out by BCAL we believe there to be other mineworks on the site, or at least a very strong possibility of them. In addition, our report states that has been substantial subsidence in the area around the site. We believe these issues to pose serious questions about health and safety with regards to developing the site. "The Secretary of State looks to local planning authorities and planning developers to implement the advice in these guidelines. This should ensure that, in most instances, unstable land is identified at any early stage in the planning process, appropriate policies are developed for its use and planning applications are decided on the basis of adequate information." "The Coal Authority wrote on 6/11/2003 and advised that whilst the site is within a likely zone of coal mining preceding 1928, any ground movement should now have ceased. Additionally, there are no recorded shafts within the site." This is the sum total of consideration of mining activity and its health and safety implications in the entire planning application put to the committee. This is in direct contrast to the considerable amount of space given to other issues, such as the archaeological impact of the proposed development. Furthermore even these three lines lack conclusiveness, stating that the site's past use for coal mining is 'likely', and that ground movement 'should' have ceased. Given this uncertainty, is there not a duty on the part of the developer to carry out further investigation to reach a more definite conclusion? Given the information outlined above, we strongly believe that there have been serious shortcomings in the application to develop Whitehall Playing Fields, which could have extremely serious consequences for those working on the site or using the facilities in the future. The planned development includes the construction of new buildings and a car park, which will necessitate the use of heavy machinery. And although we are unable to state that there has been deliberate negligence on the part of Bristol City Council or the City Academy in making the application, we certainly think that this should not be dismissed. As individuals who have closely followed the history of the proposed development, we have identified countless examples of perceived bad practice from both parties, which have formed the basis of a lengthy letter of complaint to the Ombudsman, from whom we are currently awaiting a formal response. We hope you will give due consideration to our concerns over this matter. The City Academy has stated that development of the site will begin within the next three months. We do not feel that this work should be allowed to commence until these issues have been fully addressed.